Provide comfort for the family of Yvette Vincent with a meaningful gesture of sympathy. 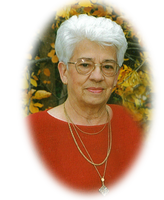 It is with heavy hearts that the family of Yvette Vincent of Bonnyville, Alberta announces her passing on Thursday, March 28, 2019 at the age of 93 years. Yvette will be forever loved and remembered by her four children: Claudette (Garry) Legault, Paula (Léo) Vasseur, Dorianne Vincent, Gill (Renée Fox) Vincent; thirteen grandchildren; fifteen great grandchildren. Yvette was predeceased by her husband: Marcel Vincent; daughter: Gisèle Vincent; parents: Florida Patenaude & Armand Lebeuf; two brothers: Maurice Lebeuf, Yvon Lebeuf; parents-in-law: Jeanne Chayer & Clément Vincent; as well as numerous brothers-in-law & sisters-in-law. Prayer Service, Thursday, April 4, 2019 at 7:00 p.m. at St. Louis Roman Catholic Church, Bonnyville, AB. Mass of Christian Burial, Friday, April 5, 2019 at 10:30 a.m. at St. Louis Roman Catholic Church, Bonnyville, AB with Father Rene Realuyo as celebrant. A private family inurnment will take place at St. Louis Roman Catholic Cemetery at a later date. In lieu of flowers, memorial tributes in memory of Yvette may be sent to Camp St. Louis, PO Box 8120, Bonnyville, AB T9N 2J4 or Sisters of Charity Notre Dame d’Evron, 8537-89 Street NW, Edmonton, AB T6C 3K4. Our deepest condolences to all the families of Yvette. Such a grand lady and a good friend.She will be missed. To my dear friend Dorianne and family. I’m so very sorry for your loss. Please accept my heartfelt condolences. Nicole L’espérance. Dear Gil, Renee and family. Robert and I were saddened to hear of your loss. A mother, grandmother and great grandmother is a huge loss to the whole family. We send you our prayers and hopes that a lifetime full of beautiful memories will sustain you through these difficult days.